"It was such a joy to see you conduct--and I saw moments when you were really enjoying your own music! It doesn't get any better than that." "When I was learning 'Birds in Winter' in 1997, I found that, as I knew it better and better, I continually found more things within it to appreciate. I played it as part of my 1998 recital, and decided to repeat it again on this year's program. Relearning it this summer, I was reminded again of how much I like the piece. It has also been very popular with the audience on both occasions." --Josh Layne, harpist, Victoria, B.C. "I found your textures [in the CD 'Love Without a Name'] so satisfying, loved the melodies in the l.h., and the tonalities and rhythms were intriguing." "These are really charming pieces [in the CD 'Love Without a Name']. I can understand why they remember them fondly years later. This CD is a really very special tribute to the best in the teacher/student relationship. To give so freely is not so ordinary." "The piece ['Dawn at San Juan Mesa'] went over very well both for the students and the audience. As for me, in addition to liking the piece, I was very happy with the 'playability' of it. As you know, it is sometimes difficult to find good music that is not an arrangement, that a youth orchestra can play really well." "Your album with 'Petroglyph for Strings' was brought over by your Dad recently, Mike. I played it here at home and was very impressed. I then played it for my theory class as a good example of motivic development and phrase extension. They were unanimous in liking your writing." "Being an alumnus on the tour to Washington DC was an amazing experience in itself. However, the mentorship and friendship Mr. Mauldin showed me then, and has given to me over the past eight years, is more magical and meaningful than any tour." "A friend, a clarinetist and member of the faculty of the conservatory here, played his recording of your 'Three New Mexico Landscapes' for the other evening. It is a delightful work and I enjoyed it very much." "Everyone who spoke to me felt that your talent and dedication was clearly evident in the compelling music we heard. I consider it fortunate that Ghost Ranch was allied with you in this endeavor." "I must thank you for your piece 'Birds in Winter' for the harp. I have performed it many times also in my exam and last time yesterday in a harp concert. Every time I play it there is someone who comes after the concert to say that it is so beautiful and touching piece. And it really is. It is also a wonderful feeling to perform it because it's so well written for the harp. In my harp exam one of the censores almost started to cry because it was so beautiful piece! So thank you a lot! I really love your piece!" "I am so happy that your piece ['Fajada Butte'] was a success and that people were enlightened by your feelings for place, essence, time. Although the learning situation here is excellent, and the performance standards are high, there is so little feeling in the people. Students work very hard toward a thing which is foreign to them. Art is not the goal." "I'm sorry that I have never had the chance to meet you on your visits to Chaco Canyon. Like Ellen, I'm a ranger at the park and also now a fan of your music." "Well, the initial excitement is gone, but the glow remains. What a delightful two days you afforded us. Your music is exciting and challenging and it was a pleasure to perform. 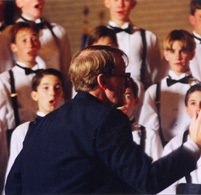 Your choral music shows a real understanding of voices, voicing and nuance within the choral concept. I have heard nothing but raves about your music from performers and listeners alike." "I like the whole 'Fiesta de Fe' enormously: the idea back of it, the images and feelings it evokes, and of course the music itself. And it pleases me greatly to find that you share my feeling--ant that of many other people--for the Southwest." "I'm listening to your tape as I write this. 'Promontory Night' is the stand-out composition. It made me feel choked-up, reverent, and humble. You have power, that's clear. The spirit of this land is captured and expressed, and for this I envy you." "As a high school freshman I showed up at your door, clammy hands and beads of sweat on my brow. You patiently explained your procedures, demonstrated exercises, assigned my first 'real' piece and sent me on my way with encouragement and a grin. I returned three days later and requested another assignment. My love of piano was off to a great start. Through the next four years you guided and directed me, not just musically but emotionally as well. You became my touchstone through a difficult growing period. You listened, consoled, prodded, and pushed. You were exactly what I needed when I needed it." --Susan Bryant, former private student. "We had a truly outstanding convention. I wish you could have heard the thunderous applause at the New Mexico Composers Recital when it was announced that you had won the Ithaca Competition. You were very much there in spirit if not in body! Your five preludes, played so capably by Jane Viemeister, are an absolute delight." "Enclosed is a copy of the program from this past summer when I played 'Three Prayers for Peace' at St. Peter's Church in St. Albans, England. The piece was well received, and three organists asked for copies of it." "I played the tape of the American Saga Concert for my 87-year-old father, and while he was appreciative of the chorale's singing, he became completely absorbed with your and Governor Lamm's work ['The American West'] and asked if we could please get a tape for him. His health has been deteriorating, though his mind has remained clear, so it is difficult to find things that give him pleasure. Yet your work truly excited him." 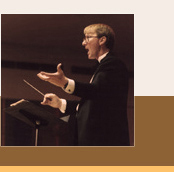 "I enjoyed your music and your teaching style! The students really were thrilled to be with you, and in looking at the video, I see how important that kind of interaction is." "I wonder sometimes if you realize your significance. I wonder if you comprehend how much you add to the lives of people like me, and my son. How much joy and fulfillment you help us find." "Your compositions, 'Impressions', for piano and electronic keyboard, are a most ingenious use of resources available to most piano teachers." "Most of my piano students own at least one electronic keyboard and I also teach electronic keyboard classes to students with no piano at home. At last, something worthwhile ['Impressions for Synthesizer and Piano'] that I don't mind teaching to both types of students." "This is just a personal note to thank you for your wonderful comments in judging the North Carolina student composition contest. Your comments were very positive, very specific, with extremely helpful suggestions. Although two of my students were selected as winners, your comments to the one who did not place were just as encouraging." "Your class at our summer 'piano camp' was so good and we appreciated your manner with the students. We have heard fine reports from students about you and we all enjoyed your compositions so much. We will always remember your playing for them as 'your gift' to them." "Your 'Fanfare for the Anasazi' was excellent. I can think of no better place than it had for a first performance [Spruce Tree Ruin at Mesa Verde]. About ten years ago a young man from Czechoslovakia visited our home. We spent considerable time [discussing] Smetana's 'Ma Vlast', and how he felt it described his country. Yesterday I played the tape you sent me [of the Spruce Tree concert] and my mind went back to my young Czeck friend. I could not get it out of my mind that you would be the ideal person to compose such a 'Ma Vlast' of the Anasazi." "Your work ['Mountain Light'] made the event a meaningful one; it projected the beauty and power of the mountains and the enjoyment which can be experienced through submission to their environment; and it was a moving expression of our philosophy as we went about designing and building the conference center." "Thanks for your letter and tapes. I have listened to everything with great pleasure. It's that all too rare thing--music that is straight from the composer's ear and heart. It has beautiful technique and a real compositional voice. Altogether a pleasure." "I find a mystical quality to your works that becomes more pronounced with repeated listenings." "It was a pleasure to conduct your 'Tribute to a Young Soldier'. It is an excellent work, deserving a place in the repertoire." "I always remember you and your wonderful choir. I'm shy and reserved man and always have of difficulties in expressing my feelings. But I must say frankly that I'm very happy I had a chance of meeting Americans and visiting the picturesque state of New Mexico. They were so kind and friendly to me and the Kressivo. I often listen to your music and I go on discovering new and interesting things for myself and my music in it." --Anatoli Kazak, leader of the Russian folk-singing group Kressivo, the US concert tour of which Mauldin organized to raise funds to bring children from the Chernoble area here for six weeks of uncontaminated air, water and food. "Words that come to mind as I hear your music are 'magical', 'powerful', 'marvelous'." "Of all the gifts I have received, that piece ('Mountain Air', written as a graduation present) remains one of the most special. And yes...I still have it memorized." "I have to tell you that you gave my boys a wonderful gift. Both of them, especially Colin, now call themselves composers. I thank you for your inspiration and enthusiasm." "It's a pleasure to get contemporary music that is accessible to our listeners." "I'm the shamefully prideful boy who always wanted to conduct the hardest pieces. Thank you for all your patience and help in teaching me how to conduct." "In the short period of time we spent together, I learned so much more than could be taught simply by reading any textbook or studying any piece of music, I had a face-to-face experience with an excellent classical music composer, and despite some of my naive and wild hopes and dreams, you told me the truth about your work." "I wish Michael all the best as he joins the ranks of retired choir directors. I would like to sympathize with all those, whose love of children has prompted them to give so much of their lives to their care, upbringing and character development, and yet had to live with the constant threat of the actions of those who interpret such efforts in a hostile manner. Your own efforts, Michael, and the way in which your boys have responded to them, are a great source of pleasure to many parents, boys, but especially to you, as you will no doubt look back in the years to come realizing that the fruits of your labor of love will no doubt prove so worthwhile in ways you cannot possibly imagine." "I too have retired--just got too crippled up to keep up with it. The KIDS go on--and they're great! Get up here to see them. Your visit (with the Albuquerque Boy Choir) was one of the most memorable of my life and I have tremendous admiration for the miracle you have created." "My experience is that there are very few creative people who are also fastidious about administrative details, and I think that makes you truly unique."